Josh Matavesi's late interception try ensured Ospreys started their European Champions Cup campaign with a win against Exeter Chiefs in Swansea. Exeter had led 10-6 at half-time at the Liberty Stadium thanks to James Short's try and the kicking of Gareth Steenson. Dan Biggar missed more kicks at goal than he converted in the first half, but after the break the Ospreys fly-half was simply superb. But Exeter matched them blow for blow until Matavesi's piece of opportunism. Ospreys have had a poor start to their Pro12 league campaign, winning only twice, while Exeter arrived full of confidence as currently the second best side in the English Premiership. But the form book seemed to be no early indicator as Ospreys edged it on the scoreboard, with Biggar kicking two penalties to Steenson's one. The Ospreys pack, with the likes of returning Wales stars Alun Wyn Jones, Dan Lydiate and Justin Tipuric to the fore, piled into their opponents. But Exeter countered with an adventurous back line, although a little over-eagerness spoilt some promising positions. Exeter should have been ahead but Luke Cowan-Dickie knocked on as he dived for the line under pressure from Paul James. The visitors did capitalise on one of their opportunities though, when Will Chudley fielded Biggar's clearance and dummied Eli Walker to go through the gaping hole his sleight of hand had created. 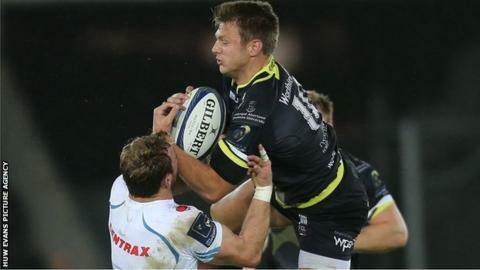 The scrum-half fed Short at pace and the winger ran past two poor attempted tackles by James King and Biggar to score. Biggar's form then dipped as the fly-half, usually so accurate, missed two late penalty kicks to leave Ospreys trailing 10-6 at half-time. The Wales star came out for the second half determined to make amends and the high kick and gather - his trademark during the World Cup - set Ospreys on the front foot, leading to a penalty that Biggar this time converted. Although his next attempt hit the post, Ospreys continued to pile on the pressure to earn Biggar another pot at goal and the fly-half this time kicked the home side into the lead. That lasted 10 minutes as Exeter worked their way back into the game, with Steenson kicking his second penalty when Lydiate and Tipuric were caught going off their feet at a ruck. The lead continued to exchange hands as Biggar struck a drop-goal - having missed two earlier attempts - after his forwards rumbled him into position. The Ospreys fly-half seemed to have overcome his blip in the nick of time for the home side, providing proof when he kicked a 40m penalty after Exeter collapsed a scrum. A game that had been so tight then turned on a mistake, as Steenson hurled a long pass on the edge of Ospreys' 22 that was read by Matavesi. The centre raced away and had just enough pace and presence of mind to hold off Jack Nowell and slide over the line for a converted try. With the game between French clubs Bordeaux-Begles and Clermont Auvergne postponed due to the terrorist attacks in Paris, Ospreys hold the early advantage in Pool 2. Ospreys head coach Steve Tandy: "It's making sure you win your home games, and see what you can pick up on the road. "Hopefully, we can go out to Clermont, try to score some points and see where that takes us." Exeter head coach Rob Baxter: "We didn't really look comfortable and happy out there and bursting with energy and enjoyment to really get stuck into the game. "We were nervy and edgy early on, and then that became ragged with some ill-disciplined play later." Ospreys: Dan Evans; Dafydd Howells, Jonathan Spratt, Josh Matavesi, Eli Walker; Dan Biggar, Brendon Leonard; Paul James, Scott Baldwin, Dmitri Arhip, Lloyd Ashley, Alun Wyn Jones (capt), Dan Lydiate, Justin Tipuric, James King. Replacements: Sam Parry, Ryan Bevington, Aaron Jarvis, Rory Thornton, Dan Baker, Tom Habberfield, Sam Davies, Ben John. Exeter: Jack Nowell; Matt Jess, Henry Slade, Sam Hill, James Short; Gareth Steenson (capt), Will Chudley; A Hepburn, Luke Cowan-Dickie, Tomas Francis, Mitch Lees, Damian Welch, Dave Ewers, Julian Salvi, Don Armand. Replacements: Jack Yeandle, Carl Rimmer, Moray Low, Ollie Atkins, Tom Johnson, Dave Lewis, Ian Whitten, Michele Campagnaro. Touch judges: Giuseppe Vivarini (Italy), Touch Judge 2 Stefano Roscini (Italy). Fourth official: Richard Brace (England). Citing commissioner: John Montgomery (Scotland).